In times like these, the last thing you need is a hospital bill that can wreck an already fragile budget. This is often the fate of elderly patients who incorrectly assume that Medicare will cover everything. Not so, as my aunt discovered early last year after a two-night, 2 ½-day -day stay at a for-profit hospital in Florida. There is a lesson: No matter who is footing the bill, hospital charges should be carefully vetted by someone who, with the Internet and perhaps professional help, can decipher the codes and uncover unreasonable and erroneous charges. My aunt, then 88, had fainted in her apartment and was taken to the hospital by ambulance. After an evaluation in the emergency room, she was admitted to the hospital for what turned out to be a side effect from a new medication. Five months later, she received a bill stating that of total costs of $18,865 (which included $5,874 for a justifiable CT scan of her head and brain), she still owed $992.60 after Medicare and secondary insurance. The sum seemed prohibitive to my aunt, who lives on Social Security and a small pension. But that is not what prompted her daughter to question the bill and carefully review the itemized charges. "What leaped out at me was a charge of $456.67 for the eyedrops she uses once a day," my cousin told me. "My mother pays $85 for her prescription, which lasts about 40 days, and she had her own drops with her." Further perusal revealed that each baby aspirin, each multivitamin, each 500-milligram tablet of vitamin C and each dose of stool softener was billed at $4.07, for a total of $40.70. She was also billed for six doses of a heart medication ($10.81 each), only two of which should have been administered. When my cousin called the hospital to question the charges and explain her mother's limited finances the hospital suggested an audit but warned that such investigations often leave the patient with a larger bill. My cousin refused to be intimidated and requested the audit, which resulted in the removal of nine erroneous medication charges and a bill reduced to $500. And when she replied that this was still more than her mother could afford, the hospital lowered the bill to $200 - as long as she paid it that day. This week the Fed altered their end-of-meeting statement by just a few words, but those words have a lot of meaning. It seems they are paving the way to a new round of quantitative easing (QE2), if in their opinion the situation warrants it. A trillion dollars of new money could soon be injected into the system. Tonight we explore some of the implications of a new round of QE. Let’s put our speculation hats on, gentle reader, as we are moving into uncharted territory. There are no maps, just theories, and they don’t all agree. Albert [Edwards] and I have a reputation as bears. And it’s true that we tend to focus on the downside. But that’s because we believe that over the long haul, those who think about risk scenarios - whether precedented or not – are more likely to be prepared for them and to know a good hedge when they see one. So this week I want to explore some insurance ideas around inflation, deflation, bond market blow-ups and oil market instability. If we can manage our downside risks well, the upside will look after itself. “Hope for the best, prepare for the worst,” goes the adage. It would be nice to think that the crash and near collapse of 2008 was anomalous, unusual and unlikely to be repeated. But a cursory glance at any history book shows how regular such ‘outliers’ are. We wish it weren’t true, but the fact is that bad things happen. Regular readers know Albert and I spend a lot of time thinking about downside risks. We don’t do this because we think we can predict when they’ll happen or even if they’ll happen. We do it because they might happen and the most basic defence against the ‘sea of troubles’ is to be aware of just how outrageous the slings and arrows of fortune can be. We have no qualms about being thought of as extreme bears … but the truth is that being realistic isn’t the same as being pessimistic and we’d bet on the prepared realists over the blind optimists every time. If readiness is the first blockade against the unexpected, well chosen insurance is the electric fence. So this week I want to focus on some insurance ideas. The Dow Jones Industrials spent 25 years in the wilderness after the 1929 Crash. Not until 1954 did the disgraced 30-stock average regain its Sept. 3, 1929, high. And then, its penance complete, it soared. In March 1955, the U.S. Senate Banking and Currency Committee, J. William Fulbright of Arkansas, presiding, opened hearings to determine what dangers lurked in this new bull market. Was it 1929 all over again? One of the witnesses, John Kenneth Galbraith, a 46-year-old Harvard economics professor, seemed especially well-credentialed. His new history of the event that still transfixed America, "The Great Crash, 1929" was on its way to the bookstores and to what would prove to be a commercial triumph. An alumnus of Ontario Agricultural College and the holder of a doctorate in agricultural economics from the University of California at Berkeley, Galbraith had written articles for Fortune magazine and speeches for Adlai Stevenson, the defeated 1952 Democratic presidential candidate. He was a World War II price controller and the author of "American Capitalism: The Concept of Countervailing Power." When he stepped into a crowded elevator, strangers tried not to stare: he stood 6 feet 8 inches tall. Given the data in hand, it's clear that past growth downturns of the same extent have often gone on to become recessions. 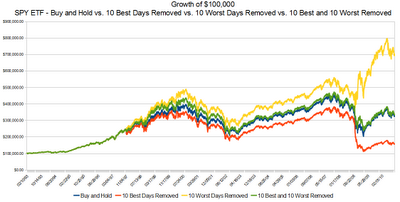 However, there are a few exceptions where these growth rates dipped below zero and then recovered. If we had good reason to expect positive economic tailwinds, we would be less concerned about the present deterioration. Unfortunately, my impression is that the bulk of the growth that we did observe coming off of the June 2009 economic low was driven by a burst of stimulus spending coupled with a variety of programs to pull economic activity forward. My concern is that these synthetic factors are now trailing off, with little intrinsic economic activity to carry a recovery forward. Suffice it to say that we're not yet out of the woods. Our investment strategy is a long term one. We don't rely on being "right" about individual instances. Rather, we focus on average outcomes, taking greater exposure to risk in conditions that have historically been associated with favorable returns and taking less risk in conditions that have historically been associated with weak returns - on average. The present overall return-to-risk profile is not favorable, on average. But again, despite our present defensive position, we would prefer - hands down - to be wrong about oncoming economic weakness. In our view the market is already fully priced for an economic recovery anyway, so the challenges are steep for investors even without a further downturn. As I've noted before, risk management is forgiving. During the past decade of rich valuations, and based on our analysis, throughout history, the temporary returns that investors have missed during periods of hostile valuations and overbought conditions have been more than compensated by the avoidance of subsequent - often profound - losses that correct those valuations. But this is a long term, average tendency. We aren't market timers - we are risk managers. For now, conditions continue to stack on the defensive side. Former Federal Reserve Chairman Paul Volcker scrapped a prepared speech he had planned to deliver at the Federal Reserve Bank of Chicago on Thursday, and instead delivered a blistering, off-the-cuff critique leveled at nearly every corner of the financial system. Standing at a lectern with his hands in his pockets, Volcker moved unsparingly from banks to regulators to business schools to the Fed to money-market funds during his luncheon speech. He praised the new financial overhaul law, but said the system remained at risk because it is subject to future “judgments” of individual regulators, who he said would be relentlessly lobbied by banks and politicians to soften the rules. “This is a plea for structural changes in markets and market regulation,” he said at one point. Here are his views on a variety of topics. More and more investors aren't bothering to pore through corporate reports searching for gems and duds, but are trading big buckets of stocks, bonds and commodities based mainly on macro concerns. As a result, all kinds of stocks—good as well as bad—are moving more in lock step. On a "risk on" day, the mood of investors is confident and they flood into stocks and other investments perceived as risky, such as junk bonds, emerging markets and commodities. But when it's "risk off," money comes sloshing out of those investments and into so-called safe-haven investments such as U.S. Treasurys, the U.S. dollar or Japanese yen. Shortly before the May 6 "flash crash," for example, a macro concern—the yen's sudden rise against the euro—triggered a wave of stock selling. Some stock pickers are trying to adjust by folding more macro analysis into their thinking. "For years I had believed that I didn't need to take a view on the market or the economy because I considered myself a 'bottom-up investor,'" said hedge-fund manager David Einhorn of Greenlight Capital last year. "The lesson that I have learned is that it isn't reasonable to be agnostic about the big picture." Mr. Einhorn, known for his high-profile bet against Lehman Brothers right before it collapsed, has placed a big macro bet that gold prices will rise because of concerns about the U.S. budget deficit and its damaging effect on the U.S. dollar. Dylan Grice, a strategist at Société Générale, says, "Most of us are rubbish at seeing macro events coming, let alone timing them." Most stock pickers have portfolios with dozens or hundreds of investments, so getting a few calls wrong generally doesn't make a big dent in returns. But macro funds tend to have a lot riding on a handful of bets. John Burbank, founder of Passport Capital LLC, a San Francisco-based macro-hedge-fund manager, thinks the macro-driven environment will persist for some time. The reason, he says, is the difficulty of solving some of the issues that have led to the macro-dominated markets, such as the U.S. budget deficit and economic overcapacity that has resulted in persistent high unemployment rates. Mr. Burbank says he is building a network of sources in Washington in an effort to get a better read on political and regulatory issues. He compares investing in the U.S. to investing in emerging markets, where he started his career. "What is happening with the country, with the government, and what are their policies? These are the questions as an emerging-market investor that you ask before you do any bottom-up work on stocks," he says. Many stock pickers, bound by rules that require their funds to keep investing in stocks, can only tweak their strategies and hope that the current environment doesn't last much longer. When Jason Grodensky bought his modest Fort Lauderdale home last December, he paid cash. But seven months later, he was surprised to learn that Bank of America had foreclosed on the house, even though Grodensky did not have a mortgage. Grodensky knew nothing about the foreclosure until July, when he learned that the title to his home had been transferred to a government-backed lender. "I feel like I'm hanging in the wind and I'm scared to death," said Grodensky. "How did some attorney put through a foreclosure illegally?" Grodensky's story and other tales of foreclosure mistakes started popping up recently across South Florida. This week, GMAC Mortgage -- one of the nation's largest mortgage servicers and a major mortgage lender -- told real estate agents to stop evicting residents and suspend sales of properties that had been taken from homeowners in foreclosure. The company said it might have to "correct" some of its foreclosures, but was not halting those in process. In Florida courts, which have been swamped with foreclosure cases for several years, mistakes "happen all the time," said foreclosure defense attorney Matt Weidner in St. Petersburg. "It's just not getting reported." Some foreclosure defense attorneys have questioned whether similar practices involve other lenders as they push huge numbers of foreclosures through the courts. In one South Florida foreclosure case, Chase Home Finance executive Beth Cottrell said in a deposition in May that her team of eight supervisors signs 18,000 documents a month. Chase's spokesperson did not comment. Nick Webb has put together a great site for information on Warren Buffett. Michael Eisner has written a new book in which the partnership of Warren Buffett and Charlie Munger is one of the featured partnerships. The bankruptcy of Lehman Brothers is widely misunderstood: We have inverted a morality tale about individual recklessness to become one about collective culpability through inaction. This month marks the second anniversary of a colossal failure that has shaped financial officials’ response to the ongoing global crisis, legislators’ attitudes toward reform, and the public’s perception of fairness. The failure is the fundamental misunderstanding of the events surrounding the bankruptcy of Lehman Brothers. We have inverted a morality tale about individual recklessness to become one about collective culpability through inaction. Lehman failed as it should have failed. That we have ex post made it the fulcrum of the financial crisis misrepresents events in three material ways. On the subject of inflation, I should emphasize that while I expect inflation pressures to be contained for several years, the impact of massive deficit spending should not be disregarded simply because Japan, with an enormously high savings rate, was able to pull off huge fiscal imbalances without an inflationary event. We may be following many of the same policies that led to stagnation in Japan, but one feature of Japan that we do not share is our savings rate. It is one thing to expand fiscal deficits in an economy with a very elevated private savings rate. In that event, the economy, though weak, has the ability to absorb the new issuance. It is another to expand fiscal deficits in an economy that does not save enough. Certainly, the past couple of years have seen a surge in the U.S. saving rate, which has absorbed new issuance of government liabilities without pressuring their value. But it is wrong to think that the ability to absorb these fiscal deficits is some sort of happy structural feature of the U.S. economy. It is not. It relies on a soaring savings rate, and without it, our heavy deficits will ultimately lead to inflationary events. Hyperinflation is a much different story, and as I've said before, I am not in that camp. This doesn't exclude the possibility that enough policy mistakes will change that, but for now, my inflation outlook is flat for several years and then accelerating in the second half of this decade. As Peter Bernholz notes in Monetary Regimes and Inflation (an economic study of inflation, including more than two dozen cases of hyperinflation), "The figures demonstrate clearly that deficits amounting to 40 per cent or more of expenditures cannot be maintained. They lead to high [inflation] and hyperinflations, reforms stabilizing the value of money, or in total currency substitution leading to the same results. The examples of both Germany and Bolivia suggest that at least deficits of about 30 per cent or more of gross domestic product are not maintainable since they imply hyperinflations... [In nearly all] cases of hyperinflation deficits amounting to more than 20 per cent of public expenditures are present." At present, U.S. federal expenditures are about $5 trillion, versus about $4 trillion of revenues, and GDP of about $14.6 trillion. So the federal deficit is running at about 20% of expenditures, but less than 7% of GDP. This is not a profile that is consistent with hyperinflation, but it is also not a benign policy. Continued deficits will have substantial economic consequences once the savings rate fails to increase in an adequate amount to absorb the new issuance, and particularly if foreign central banks do not pick up the slack. We're not there for now, but it's important not to assume that the current period of stable and even deflationary price pressures is some sort of structural feature of the economy that will allow us to run deficits indefinitely. Found via Infectious Greed. Included in the video are Nouriel Roubini and Ted Turner, among others. No. 2: Create Something That Stands Out. No. 3: Create Something That Everybody Who Works for You is Really Proud of. No. 4: Be a Good Leader. When you’re building a business from scratch, the key word for many years is “survival.” It’s tough to survive. In the beginning you haven’t got the time or energy to worry about saving the world. You’ve just got to fight to make sure you can look after your bank manager and be able to pay the bills. Literally, your full concentration has to be on surviving. Obviously, if you don’t survive, just remember that most businesses fail and the best lessons are usually learned from failure. You must not get too dispirited. Just get back up and try again. Q: What characteristics give businesses the ability to endure and adapt? A: Assessing a business’s durability and adaptability is the foundation of our investment research process at Davis Advisors. These assessments are complex and not based on rules or certainties but rather ten dencies and probabilities. As in many complex prob lems, it is often useful to begin by first inverting the question, in this case by asking, What characteris tics tend to lead to business failure or impairment? When asked in this inverted fashion, a number of answers seem immediately obvious. Generally, busi nesses fail or become impaired due to some combi nation of debt, low returns on capital, competition, obsolescence, over-concentration (by geography or product), ‘diworsification’ (a wonderful term coined by legendary portfolio manager Peter Lynch to describe foolish acquisitions), and hubris. If such characteris tics are most often associated with failure or impair ment, then we can turn back to the original question and conclude that those businesses without these traits will tend to be more durable and more adapt able. Therefore, in the face of inherent uncertainty, investors should look for businesses with strong balance sheets, satisfactory returns, sustainable competitive advantages, products with low risk of obsolescence, geographic and/or product diversification, a skeptical view of mergers and acquisitions, and a healthy fear of arrogance and complacency. Q: Are such companies always good investments? A: If identifying businesses with such attractive characteristics is the foundation of our investment process, buying them at the right price is the capstone. Because the stock market works like a pari-mutuel system, those businesses that are most admired tend to trade at the highest valuations, which in turn can make them poor investments. Q: How do such companies compare to other alternatives today? A: Because of the enormous risks in today’s economy, characteristics such as durability and adaptability should be especially highly valued. But despite these risks, shares in many global leaders are trading at or near their lowest absolute and relative valuations in decades, creating a significant opportunity for long-term investors. In our last report, we also highlighted the fact that often the largest mistakes we make will never show up in our financial statements. This is not because we are glossing over them but rather because they were mistakes of omission. For example, our costliest mistakes during this financial crisis may well be the investments we failed to make when others were panicking. Wells Fargo, for example, traded roughly as low as $8 per share and American Express as low as $10. Had we added approximately 1.5% of the Fund to each of these positions at those low prices, we would have more than made up the cumulative losses we suffered in AIG and Merrill Lynch. Finally, in our earlier discussion of energy companies, we highlighted the critical importance of capital discipline. ConocoPhillips, which was one of our largest holdings in the energy sector, failed this important test and was a meaningful detractor from our returns, particularly over the last three years. Management’s lack of discipline becomes evident when contrasted with one of our other large energy holdings, EOG. For example, from 2003 to 2009, it cost ConocoPhillips roughly 60% more than EOG to replace each barrel of oil (or oil equivalent) it sold. As a result, despite spending $111 billion, Conoco Phillips only managed to grow its reserves per share (debt adjusted) 2%. During the same period, EOG grew its reserves per share almost 80%. Over time, the combination of reinvesting huge amounts in low-returning projects as well as an ill-timed acquisition binge during which the company issued its relatively undervalued shares in exchange for over priced acquisitions destroyed an enormous amount of shareholder value. As a result, over the last five years, ConocoPhillips’ share price declined while EOG’s appreciated almost 80%. In fact, ConocoPhillips’ stock price trailed our other four holdings by an average of 12% per year. Despite our misassessment of management, we were bailed out by the rising price of oil during our holding period and were able to sell the shares at a respectable profit. Furthermore, because the shares are strikingly cheap on the basis of reserves, we continue to monitor the company and would be open to repurchasing the shares should the board and management team become more disciplined. The evidence is clear that normal monetary and fiscal transmission mechanisms have broken down. And it is not simply a matter of poor execution, although the stimulus bills and mortgage remediation plans promulgated by the government were hardly paragons of efficiency or efficacy. It appears that the U.S. and global economies have reached the tipping point beyond which the majority of money creation takes place outside the control of governments and central banks. This condition should not apply in a true crisis situation in which non-governmental actors pull in their horns and government agents are empowered by panicked politicians to pull out all of the stops and literally flood the financial system with funds. In non-crisis times, however, the market should be willing and able to fund itself. Unfortunately, due to the failure of policymakers to adopt the proper policies to stimulate growth (as well as the noxious anti-growth rhetoric and legislation promoted by the Obama administration), non-governmental economic actors (i.e. corporations and consumers) are again refusing to spend. As a result, the system has been seized by a massive paradox of thrift that is more akin to what one would expect in a crisis or near-crisis scenario. Policymakers learned the wrong lesson from Keynes. Rather than continued debt-financed government spending, they should have focused on this paradox of thrift that arises when corporations and businesses lose faith in leadership. Trying to cure a debt crisis with mountains of debt that will ultimately have to monetized is enough to make anybody stuff their cash in the mattress and start building bunkers in their back yards. Comparisons with the Great Depression are useful as far as they go, but they may not go as far as necessary to get us out of our current morass. The 21st century world and its economies are profoundly different from the early 20th century one that suffered a calamitous economic collapse. For one thing, there were leaders that people believed in; perhaps new ones will emerge now to replace the imposters who are currently in office. But the key to studying history’s lessons is not simply looking for similarities between the past and present, but drawing the proper distinctions that can lead mankind to improve his current course of action. The current approach to solving our economic ills has been driven by a near religious fear of even mild deflation, and has taken the form of a purely Keynesian brew of government spending and artificially low interest rates that penalize savers. While Keynesian stimulus was needed at the height of the crisis, maintaining this approach once markets and the economy have stabilized is a recipe for years of below trend growth and extension of the boom and bust cycle that has characterized the last three decades of the U.S. economy. The Obama administration’s economic team learned the wrong lessons from Keynes and from history. Volunteering for LibriVox is easy and does not require any experience with recording or audio engineering or acting or public speaking. All you need is a computer, some free recording software, and your own voice. We accept all volunteers in all languages, with all kinds of accents. You don’t need to audition or send us samples. We’ll accept you no matter what you sound like. We operate almost exclusively through Internet communications on our forum, where all your questions will be answered by our friendly community. We have a flat structure, designed to let people do just what they want to do. Zuckerberg’s ultimate goal is to create, and dominate, a different kind of Internet. Google and other search engines may index the Web, but, he says, “most of the information that we care about is things that are in our heads, right? And that’s not out there to be indexed, right?” Zuckerberg was in middle school when Google launched, and he seems to have a deep desire to build something that moves beyond it. “It’s like hardwired into us in a deeper way: you really want to know what’s going on with the people around you,” he said. In 2007, Zuckerberg announced that Facebook would become a “platform,” meaning that outside developers could start creating applications that would run inside the site. It worked. The social-game company Zynga—the maker of FarmVille and Mafia Wars—is expected to earn more than five hundred million dollars this year, most of it generated from people playing on Facebook. In 2008, Zuckerberg unveiled Facebook Connect, allowing users to sign onto other Web sites, gaming systems, and mobile devices with their Facebook account, which serves as a digital passport of sorts. This past spring, Facebook introduced what Zuckerberg called the Open Graph. Users reading articles on CNN.com, for example, can see which articles their Facebook friends have read, shared, and liked. Eventually, the company hopes that users will read articles, visit restaurants, and watch movies based on what their Facebook friends have recommended, not, say, based on a page that Google’s algorithm sends them to. Zuckerberg imagines Facebook as, eventually, a layer underneath almost every electronic device. You’ll turn on your TV, and you’ll see that fourteen of your Facebook friends are watching “Entourage,” and that your parents taped “60 Minutes” for you. You’ll buy a brand-new phone, and you’ll just enter your credentials. All your friends—and perhaps directions to all the places you and they have visited recently—will be right there. The backlash came swiftly. The American Civil Liberties Union and the Electronic Privacy Information Center cried foul. Users revolted, claiming that Facebook had violated the social compact upon which the company is based. What followed was a tug-of-war about what it means to be a private person with a public identity. In the spring, Zuckerberg announced a simplified version of the privacy settings. Some interesting thoughts on how they are selling loans and how they account for losses on loans at about the 6-minute mark (initially take about a 20% hit as a loss when the loan becomes non-performing, then take the next steps with the borrower; end up taking about 40-44% loss on those loans they can't work out and end up selling, according to King). The limits of the pendulum’s swing are fixed, and it tends to move back and forth over the territory between them. This occurs because (a) people tend to take trends to extremes, (b) neither extreme of the pendulum’s arc represents a perfect or permanent solution, and (c) there’s no place else to go in these regards. Thus the best way to view investment trends may be through an analogy to hemlines: all they can do is go up and down, and so they do. That question – at what price? – isn’t just the right question to ask about bonds versus stocks today. It’s the right question regarding every investment at every point in time. I try every chance I get to convince people that in investing, there’s no such thing as a good idea . . . or a bad idea. Anything can be a good idea at one price and time, and a bad one at another. The thing to think about isn’t whether you’d rather have junior or senior securities in a recession, or fixed rate securities versus variable ones in deflation. The question is which securities are priced right for the future possibilities: which ones are priced to give good returns if things work out as expected and not lose a lot if they don’t? You mustn’t fixate on a security’s intrinsic merits, but rather on how it’s priced relative to those merits. So, for example, it’s not enough to say “We want fixed rate securities in deflationary times.” You’ll be glad to be holding 2½% ten-year Treasurys if deflation materializes, but how will you feel if it doesn’t? And what’s the probability of each outcome? My point here is that simplistic blanket statements are no help at all in making investment decisions. Most of today’s positive articles about bonds are totally devoid of discussion of prices and probabilities. But it’s only by assessing those things that attractiveness can be determined. The bottom line is that, as bond prices rise (reducing yields) and p/e ratios fall, the chances increase that stocks will outperform bonds. Thus the benefits high grade bond investors feel they’re gaining through what they’re buying can be undone by what they’re paying. I’ll say it another way: the attractiveness of one investment relative to another doesn’t come from what it’s called or how it’s positioned in the capital structure, but largely from how it’s priced relative to the other. I’m impressed today by the ability to assemble a portfolio of iconic, high quality, large-cap U.S. growth stocks that will provide appreciation in a strong environment, a measure of protection in a weak environment, and a meaningful dividend yield regardless. To me, and given my standard view that we don’t know what the macro future holds, these stocks’ potential over a range of possible scenarios is more attractive than bonds which will do well in periods of economic weakness or deflation but poorly in strength or inflation. Compared to stocks, I feel Treasurys and high grade bonds currently reflect all of the environmental factors in their favor and perhaps more and are priced rich relative to stocks. For them to do well from here, with yields so low, everything has to work out as the bond bulls hope. Since few investment trends continue forever, it’s usually smarter to expect ultimate regression to the mean rather than growth to the sky. No one should view the great popularity of bonds relative to stocks without reservation.